As the indefinite fast of Narmada Bachao Andolan (NBA) leader Medha Patkar and 11 of her colleagues to protest the Madhya Pradesh government's "refusal" to rehabilitate Narmada dam oustees entered the 10th day, a government doctors' team which examined them said, they should be immediately shifted to hospital. 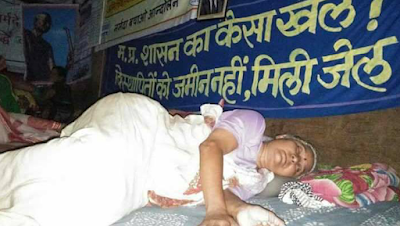 On fast at Chikhalda village in Kukshi tehsil, the doctors said, the fasting activists' blood pressure had turned "very low" and there was and ketone in the blood. The doctors examined the activists in the presence of local government officials and Kukshi MLA Surendra Singh Baghel. Refusing to budge, Patkar and others said that the authorities "should not worry only for 12 people but also for the lakhs of people of Narmada Valley still waiting for complete and just rehabilitation." They insisted that the gates of the Narmada dam, which is in Gujarat, should be opened till the state government allowed "complete and just rehabilitation" of all the oustees. Patkar's refusal to end fast came amidst Gujarat chief minister Vijay Rupani showing no readiness for compromise, saying, with the 30 gates closed, the dam's reservoir would be filled to the brink, 138.64 metres. Considered a political requirement, any decision to retract from here would mean a major loss to the BJP in Gujarat, which is going on polls in December. In Delhi, several senior politicians, including 18 MPs, appealed to Patkar and 11 others to end their fast, even as asking Prime Minister Narendra Modi to intervene immediately. Sharad Yadav of the Janata Dal United, Sitaram Yechury of the CPM and Delhi chief minister Arvind Kejriwal issued separate statements in support of NBA on similar lines. Protest in support of Patkar continued in Delhi's Jantar Mantar, with Yogendra Yadav, Alok Agrawal, Sandeep Pandey and Dr Sunilam ending their token fast. 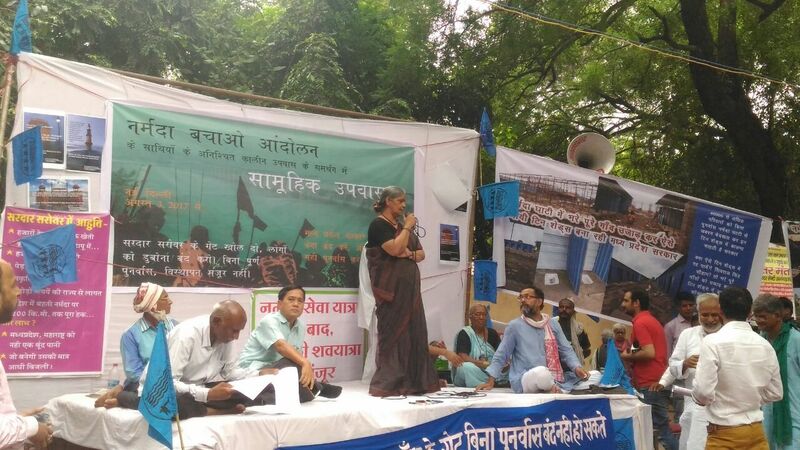 Those present in solidarity included RTI activist and Magsaysay awardee Aruna Roy, senior activist Shabnam Hashmi, CPM farmers' leader Hannan Mollah, environmentalist Soumya Dutta, Supreme Court advocate Sanjay Parikh, sociologist Prof Nandini Sundar, and Jignesh Mevani of the Rashtriya Dalit Adhikaar Manch. Meanwhile, efforts continued on the part of the Madhya Pradesh government to suggest that no one needs to be rehabilitated. Dhar district collector Shriman Shukla, who was on a visit to Nisarpur, claimed that the rehabilitation of eight villages has been completed. The villages he named were Jal Kheda and Patavar from Manawar tehsil; Mimbola, Gulati and Balwara from Dharampuri tehsil; and Sisgaon, Dehar and Dasaanda from Kukshi. However, quoting ground reports, NBA sources said, there are still 10 houses in Jhala Kheda yet to be rehabilitated, whereas the rehabilitation site of Dasanda village has not been made yet. Asked a local activist, "Where has the rehabilitation happened without any rehabilitation site? Few families were rehabilitated in Gujarat long back. Seven houses of Deher village are still left to be rehabilitated. Why is the government always putting false claims of complete rehabilitation?" Jyotiraditya Scindia, Congress MP from Guna, raised the issue in Lok Sabha and asked why was the Madhya Pradesh government illegally drowning lakhs of people in Narmada Valley and forcefully evicting them without complete and just rehabilitation and why was the government selectively picking excerpts from the Supreme Court judgment and not following the spirit of the whole judgment to solve the oustees' problem. To this, Narendra Singh Tomar, Panchayat Raj Minister, replied that the Madhya Pradesh government was following the Supreme Court orders which said that the submergence area should be evicted by July 31 and all the compliances had been done as per the orders. Contesting the minister's statement, in a communique, NBA said, "Rajneesh Vaishya from Narmada Valley Development Authority has given the figure of 7,010 families yet to be rehabilitated. Different statements about rehabilitation has proved the realities on the ground are different from what the authorities sitting in Delhi claim. The government is playing the numbers game."